We encountered this squirrel on our trip to the local park....not only was he/she very friendly and came right up to us....but as we left and walked away......my boys waved goodbye....the squirrel sat and watched us .....and didn't move..until we were out of sight....As if to say don't leave...or maybe he was hoping we were going to go back with some nuts!!!! Heh heh what a little poser!!! Awww! 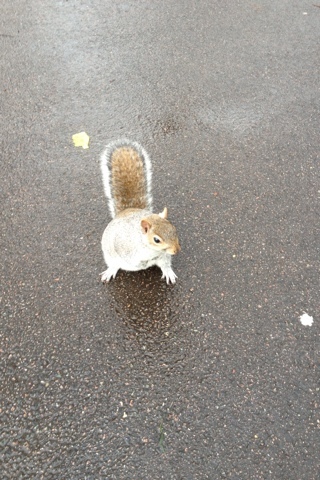 I love squirrels, the way their tail bobs behind them is sooo cute! I know they are technically vermin but why are they so darn cute?! oh wow, he was brave!